We are pleased to introduce the first of what we hope to be many Lit ‘Guest’ Reviews. In this segment, we invite our discerning friends and guests to contribute a review of a book they’ve recently read — advance reading copies (ARC) or otherwise. For our first column, we have a review by Jack Smith, a friend we’ve recently made at the shop and a self-professed crime/thriller aficionado. 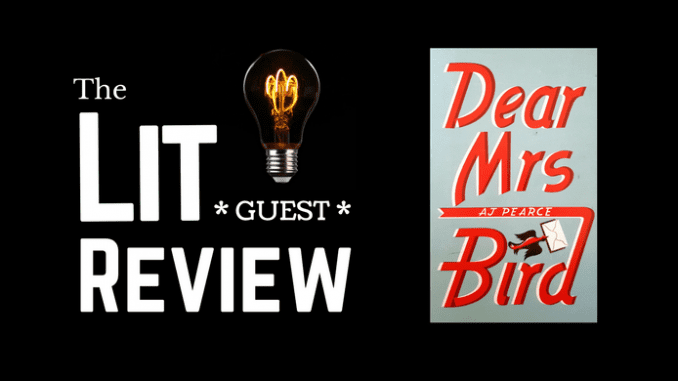 It is, therefore, quite interesting that the first book he has chosen to review for us is AJ Pearce’s debut novel Dear Mrs Bird, set in 1940s London. From the outset, Dear Mrs Bird looks a bit of a comic drama, not dissimilar to Mary Ann Shaffer’s highly readable The Guernsey Literary and Potato Peel Pie Society. The following is Jack’s review of the ARC provided by Pansing Distribution. The well-researched narrative, and a cast of fully relatable characters, puts a smile on your face almost immediately; and you imagine that it will stay there. However, given that it is set in London in the early years of WWII, there are heart wrenching episodes breaking up the general heart-warming tale. AJ Pearce employs a clever writing style which, by using typical 1940s phrases/slang and evocative descriptions of the Blitz, manages to convey a real sense of daily life in wartime London.The story approach is original and melds historical fiction with human elements of fun, comedy, tragedy and poignancy. As well as being a “romp”, it is also thought-provoking as it pulls you in with the vivid descriptions of how people coped with the uncertainties and devastation of German bomb drops. The main character is Emmeline (Emmy) Lake who lives with her best friend Bunty. This allows for the display of joys and frictions of relationships in trying times. The dialogue really does feel as if it is taken directly form Emmy’s diaries. Emmy volunteers part time for the Fire Service whilst doing her day time job, but dreaming of becoming a war correspondent. Upon seeing an advert for a Junior at a leading newspaper she thinks that this is her chance. However, in her eagerness, she fails to realise that the position is just for a typist at a failing women’s magazine. She decides to stick with it as it may lead to Better Things. Her main duty is to type answers to the letters received by the “Agony Aunt”, Mrs Bird. Unfortunately, the cantankerous Henrietta Bird will not countenance any Unpleasantness (note the capital letter), which means that the advice that the readers most need is never offered and the letters are thrown in the bin. This upsets Emmy, who secretly decides to respond, in the best way she can, to some of the desperate. The story arc then unfolds, joining together the consequences from this decision and the perhaps unsurprising result on her personal life. It wouldn’t surprise me if there is a sequel (you do wonder what happens next); and it would make a good television drama.